Heat oven to 375°F. Spray 12x8-inch (2-quart) glass baking dish with cooking spray. 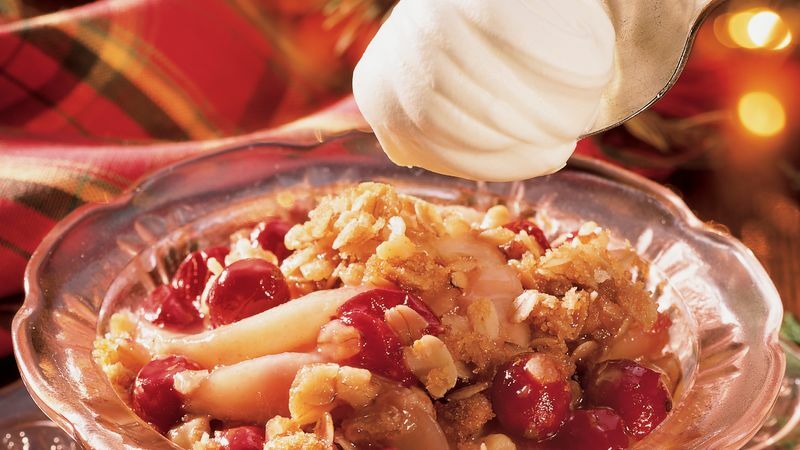 In large bowl, toss pears, cranberries, sugar, 2 tablespoons flour and orange peel to coat. Spoon into baking dish. In small bowl, mix oats, brown sugar and 1/3 cup flour. With fork or pastry blender, cut in butter until mixture is crumbly. Stir in nuts. Sprinkle evenly over fruit mixture. Bake 30 to 40 minutes or until topping is golden brown and fruit is tender. Cool 30 minutes before serving. Serve warm with whipped cream. Crisps are baked desserts of fruit topped with a sweetened crunchy pastry-like mixture. Called crumbles in England, crisps possess a warm, comforting appeal that spans the oceans. Fresh cranberries can be frozen for up to one year. Walnuts, pecans or almonds work equally well in this crisp. For best results, use firm, ripe pears with a pleasant aroma.